I recently had a table at the New Mexico film conference and used an iPad to display video. I figured I would load the video as usual then select loop from a menu item as I would on Quick Time Player or any other player on the computer. This is not an option. I then spent about an hour looking for a good easy app to loop the video and found nothing useful. Now I have a client that needs help to do the same exact thing. This client has a short video with audio that will be installed in a gallery setting. It will played on an iPad and displayed with a wall mount locking bracket. I will let you know that none of the apps out there for looping video have good ratings. But I did find one, a free app, that does the job. Download from iTunes. You will need to move the video from your computer to you iPad in the Photo folder. You need to sync pictures folder on your computer to your iPad using iTunes. In your pictures folder on your computer create a new folder named it “Transfer2iPad” Within this folder you can add subfolders for different albums or groups of pics or videos. Copy or Drag/drop the videos you want to these folders. Open iTunes and select your iPad. Click on the photos tab, check “Sync Photos from “Pictures” and make sure to check “Include Videos”. Select your “Transfer2iPad” folder to sync. You can select any or all subfolders and sync. Your videos are now on your phone under the Photos app. Go to the information button in the right bottom corner. Here you can find some options and load your video. Once you have selected your video, it does run a compression. I loaded a .m4v file and maybe it just scanned it? After your video is loaded and your settings are set, click on “Back to Presentation”. Now click “Loop Video” and all should be well. 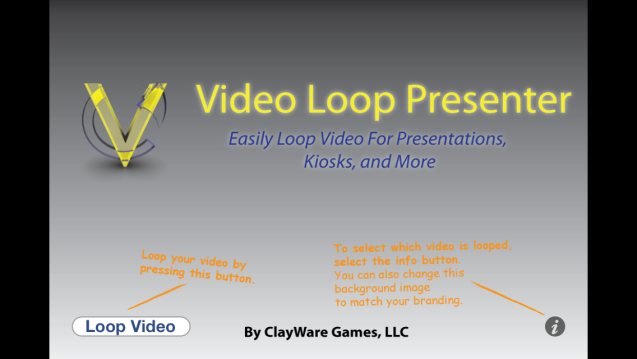 What is your experience with looping video on an iPad? Was this helpful?